HomeInsightsBlogAfricaMEA Pulse Podcast Episode 4: What is the current state of the Moroccan automotive sector? 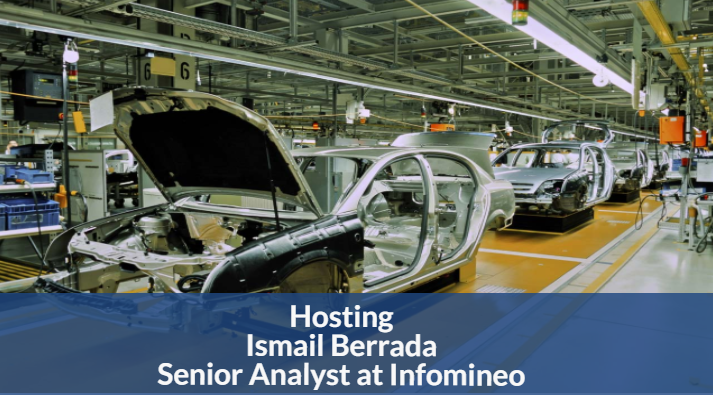 Hosting Ismail Berrada from Infomineo’s Casablanca office, MEA Pulse Episode 4 is a discussion on the current state of Morocco’s automotive sector and the factors that have contributed to foreign investment within the sector. Tune in to gain more insights on who the key investors in Morocco are and who they are serving, as well as how the government is working to encourage development within the sector. What automotive components is Morocco producing? How is the Moroccan government driving growth in the sector? What factors makes Morocco an attractive region for investment? Is Morocco an attractive region for non-European investors? What is the current state of the Moroccan automotive sector? Is there a risk that OEMs might shift to other regions to base their manufacturing? Can Morocco’s performance in the aeronautic sector be compared with its performance in the automotive sector?